Arianne Phillips won’t be styling Madonna for the Super Bowl. This time, it’ll be Jonas Åkerlund’s wife Bea Åkerlund. If you haven’t had the chance yet to listen to the amazing Golden Globe nominated score of W.E. by Abel Korzeniowski, then this is your chance. The official Weinstein Company website has been updated with the latest version. Go listen here! 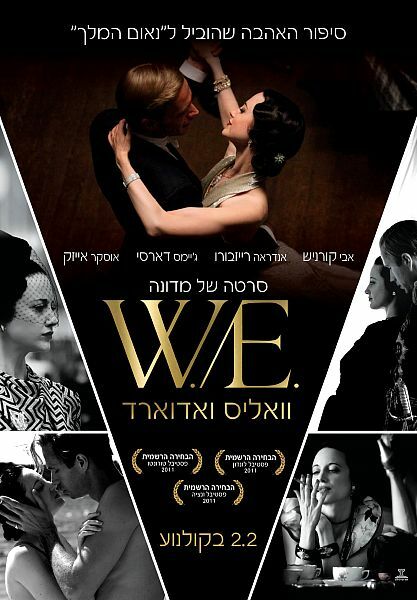 Thanks to Avihay for the Israeli poster of W.E., which will be released on February 2nd in Israel. “I am aware that everything I say and do is judged. I use that to the greater good, I know I can influence people. I think people often misunderstand my power and get intimidated by that, rather than trying to understand me. I’m interested in fame as I am kind of weary of it. I think it has its pluses and minuses. The organizers of this year’s San Remo Festival confirmed that the rumors about Madonna to take part in it are true. In a video conference to present the next edition of the festival, Gianni Morandi and Gianmarco Mazzi said they are currently in negotiations to bring Madonna to the famous Italian music festival, next February. According to Swiss Newspaper Blick, the photographer who took the first picture of Madonna on skiis in Gstaad/Switzerland last December apparently got 1000 Swiss francs for it ($1,051). Julie Frost may not be a household name, but she’s one of the songwriters behind Madonna’s Golden Globe “Best Original Song” win. As Adam Levine and Jimmy Fallon announced the award for “Best Original Song”, I thought, no matter what happens, I’m proud of our song and to be included in the same category as so many of my musical heroes. Being acknowledged by the Hollywood Foreign Press amongst a room full of so many people I admire, and accepting the award next to Madonna, was such an honor. Is it true Madonna is collaborating on one of the tracks? Not on this album – no. Famously you toured with Madonna and worked with her on ‘Celebration’, what is it like working with such an icon? Memorable and inspiring are the words that come to mind. Madonna, as we all know, is a pioneer of music. She is amazing in the studio, inspirational, and she delivers that and more to her live show. 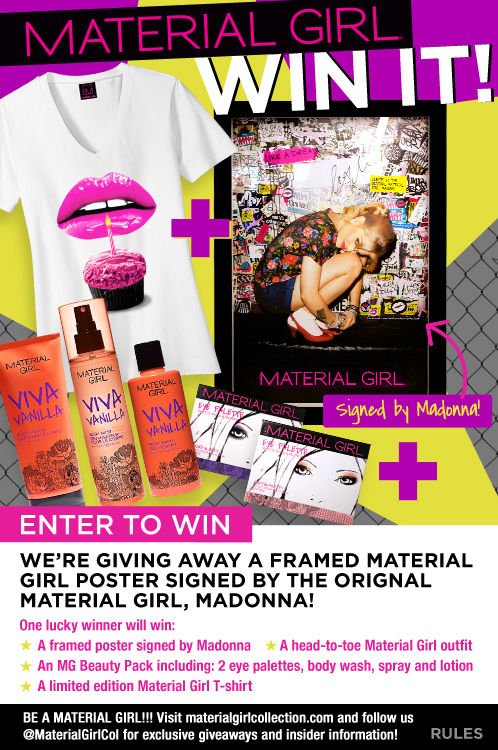 Material Girl Collection is giving away a framed Material Girl poster signed by the original Material Girl, Madonna! Want to win? Go here! I met Madonna yesterday, I sang in front of her – it was a very nerve-wracking experience. But it was fantastic. It’s been a crazy year so far and we’re only 11 days in. Hello Magazine is looking for the most elegant star from last Sunday’s Golden Globes. Go vote for Madonna!